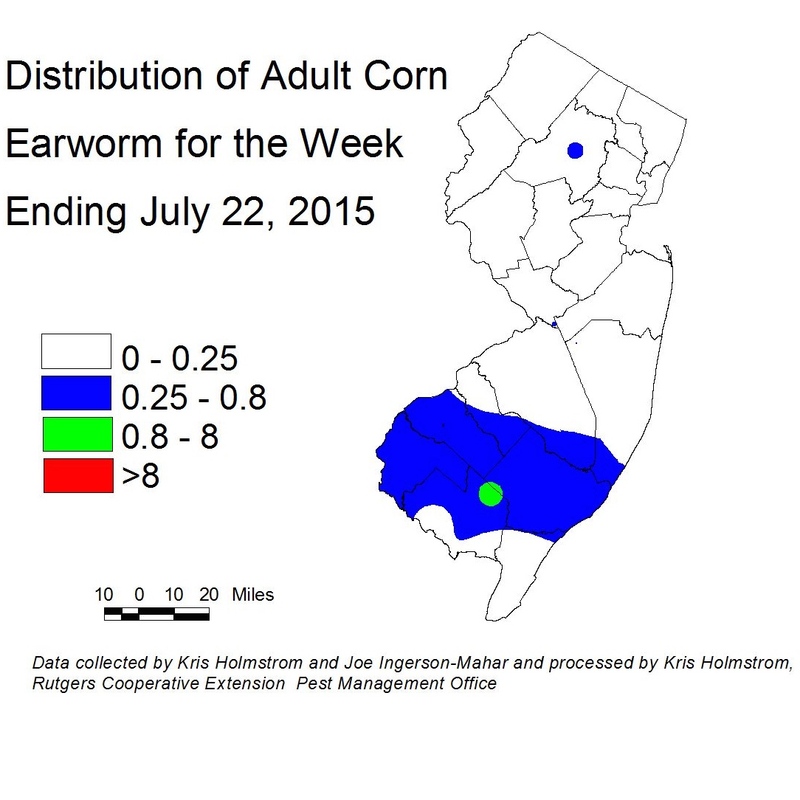 European corn borer (ECB) adult activity is starting to increase in parts of the state now. This is the beginning of the second adult flight. Areas of highest activity are currently along the Delaware Bay Shore and in central Morris County (see ECB map), but areas between should fill in over the next week. Corn earworm moths (CEW) activity continues to increase, although gradually. Blacklight traps further north in the state have registered low catches this past week. Overall activity is low for this time of year, and is still mainly from Gloucester County southward (see CEW Map). Catches in VA., and DE are still low, but trap catches published from North Carolina are showing signs of strong increase over the past week. The limited CEW pheromone trap network in the southern counties is also showing slight increases over the past week. Activity has shifted somewhat to the lower Delaware River area and along the Bay Shore (see CEW pheromone map). The low number of traps results in broad areas of color within the map. It is critical that growers monitor local CEW moth numbers. At present, light-to-moderate silk spray schedules should be adequate to limit CEW injury as well as to prevent ear damage from ECB or FAW larvae that already inhabit the stalks. 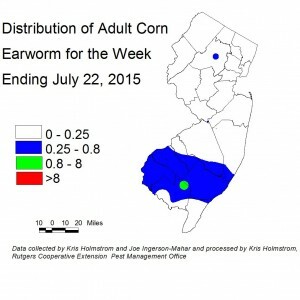 Fall armyworm (FAW) infestations are increasing gradually throughout NJ, with highest infestation rates (30 and 24%) found in Cape May and Monmouth counties, respectively. Increasing numbers of FAW moths have been captured in the region, so infestations should increase in frequency and severity. 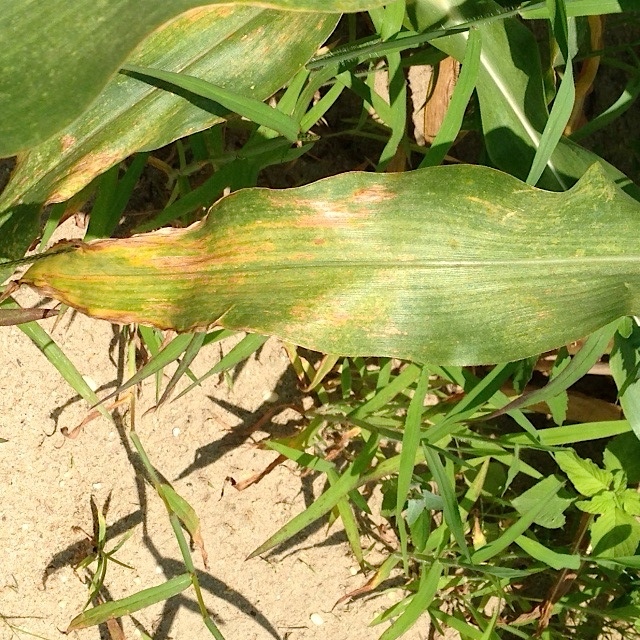 This pest can be devastating to small corn plants. Fields down to seedling stage should be scouted weekly for signs of infestation. Recently, IPM personnel have found infestations of two-spotted spider mites (TSSM) in silk stage sweet corn. 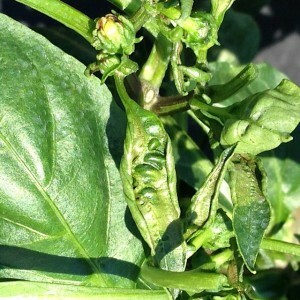 These infestations have been on lower leaves (see photos), and have not reduced the marketability of ears, but if dry weather persists, and pyrethroid insecticides are used repeatedly on silks to protect against CEW infestations, TSSM can build to levels that threaten to invade the ears. 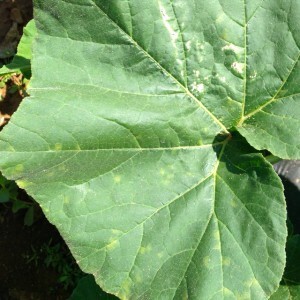 Look for yellowing lower leaves on otherwise healthy plants. Check underneath for the presence of mites. If TSSM are found on leaves just below the ears, and there is more than a week left before harvest, an application of the miticide Oberon may be warranted. 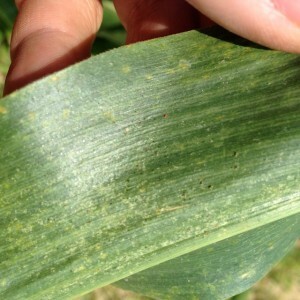 Two-Spotted Spider Mite: corn leaf damage. 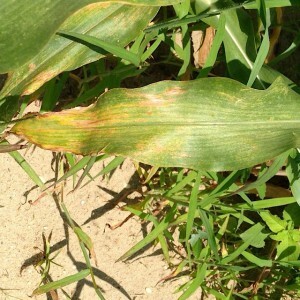 No new instances of late blight have been found since the initial infections of two weeks ago. Tomato growers should continue to protect all plantings against this disease. The strain found locally is US-23, and can infect tomatoes and potatoes, although no infections on potatoes have yet been reported. Consult the 2015 Commercial Vegetable Recommendations Guide for fungicides effective against late blight. No weevils have been trapped in the past week and as far as known there are no infested fields. If this trend continues through mid-August then we should be able to finish out the season without worrying about weevils. One field in Morris County exhibited symptoms of a cyclamen mite, or broad mite infestation. 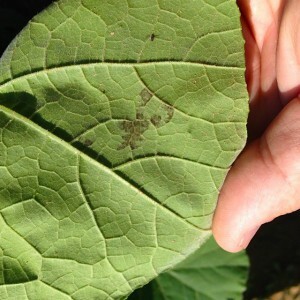 This damage is frequently confused with herbicide injury, but is actually caused by toxins the mites introduce to the plant as they feed. Typically, the youngest leaves of an infested plant will not expand properly, but will remain small and distorted. Fruit near these terminals will have a very rough skin, or lots of russet marks or “zippers” (see photos of foliar and fruit injury). These fruit will not recover, and if the infestation is not stopped, further loss of fruit will occur. Fortunately, these microscopic mites do not spread quickly. Miticides labeled for two-spotted spider mite are also effective on cyclamen mite. BMSB numbers remained low in NJ blacklight traps this past week, with a spike in activity in one trap in Cape May County. These catches are too low to create a map. 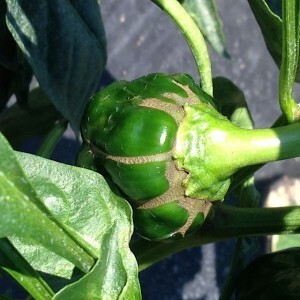 As yet, no fruit injury has been discovered in scouted pepper plantings. Cucurbit downy mildew (CDM) has been discovered today (7/22) on butternut squash, pumpkin and cucumber in the sentinel plot at the Snyder Research and Extension Farm in Hunterdon County. As yet, acorn squash, resistant cucumber, watermelon and muskmelons are uninfected at Snyder Farm. Additionally, a small number of CDM infected pumpkin leaves were found in a planting near Belvidere, Warren County on 7/21. For more information on the regional presence of DM as well as comprehensive, weekly forecasts, see the following website: http://cdm.ipmpipe.org/ Photos showing CDM lesions on the upper surface and sporulation on the lower surface are included here. Growers should consider applying both protectant and systemic fungicides to all cucurbit crops at this time, to limit loss from this disease. 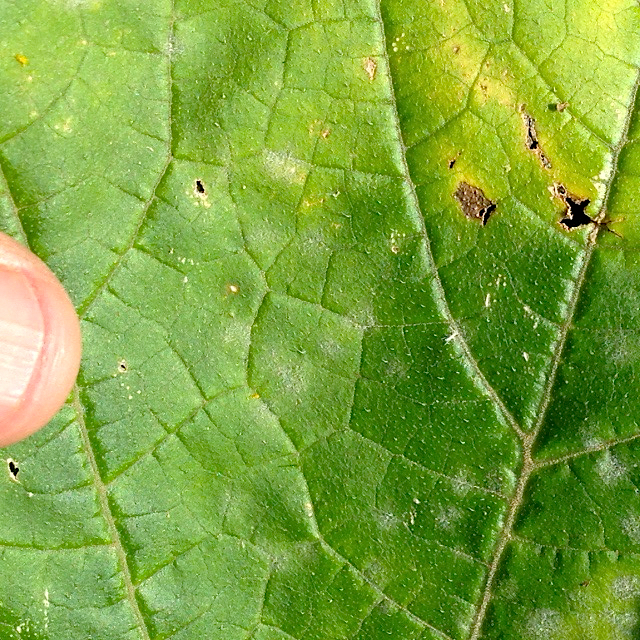 Additionally, early pumpkin fields are now showing signs of powdery mildew (PM) infection. Protectant fungicides are warranted on any fields where PM lesions (see photo of early PM lesions) are now occurring. PM does not typically occur until the host crop enters the stage of fruit enlargement. Consult the 2015 Commercial Vegetable Recommendations Guide for fungicides effective against CDM and PM. Although basil downy mildew (BDM) has been reported as far north as Middlesex County NJ, the BDM sentinel plot at the Snyder Research and Extension farm is still free of the disease. Growers should monitor basil plantings regularly to make sure BDM and Japanese beetles are not causing extensive damage at this time.